I am still busy working through various aspects of the saving of the game. 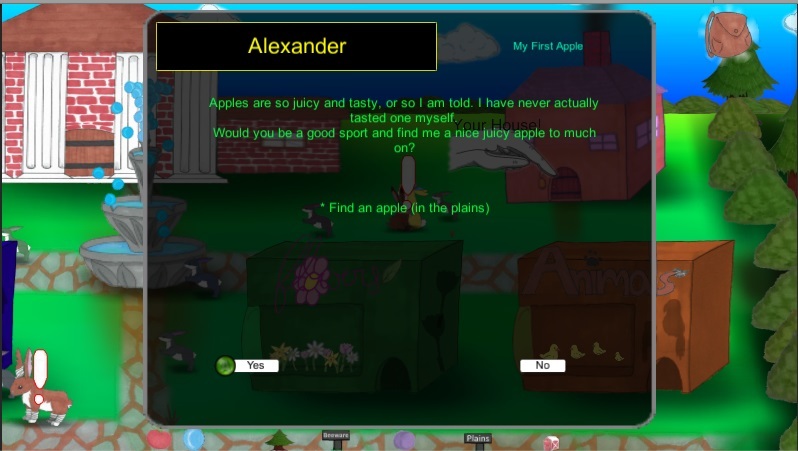 While I am doing that I am also adding SFX and music into the minigames. 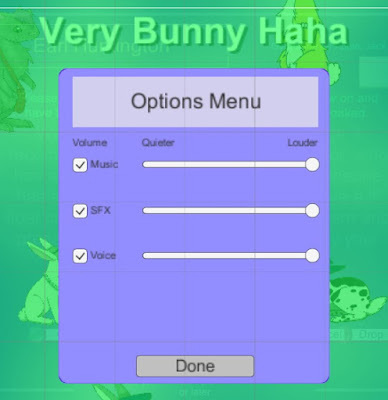 This activity brought up the fact I did not have an Options menu and I need one, at least to control the Music and SFX volumes. For me you see I like quiet music for the most part and louder SFX.. I know some prefer it elsewise. So I knocked out a quick overlay Options Menu. It amazes me how fast I can make this thing in Unity3D now, compared with 6 months ago. Heck, 6 months ago I was trying to convert Aceball from the Xbox360 Indiegames to Unity and Failed at the main menu. Well fail is a strong word, but it took me hours to get that menu created, and I found it so discouraging that I gave up on that conversion as I realized I did not know enough about working within Unity. Nowadays I can create and lay out this thing so fast. Then I can hook that into code in a matters of minutes as well. Interestingly this is the first time I have used the Toggle and Slider UI elements. This makes me feel confident and I am so pleased I can save such a large amount of time to do other things in the game. Tonight I got to have a good meeting at Panera with my daughter to discuss the game and what we need for a release. We have the first part called Chapter #1 (as opposed to Episode #1). We even know when the Chapter will complete.. but I won't reveal that at this time... more to come eh.. spoilers! Now I have the game saving recording the plants growing it makes my saves a lot more valuable. Now I can actually grow stuff in the game. YAY! This is an Image of me first starting to convert the Farm from a Hedgerow style to the New and Impressively tidy Fenced in Farmyard. This is the finished product after all the Hedges have been replaced by the wooden Fencing. I hope you will agree that this is not only tidier, but also a lot more interesting. 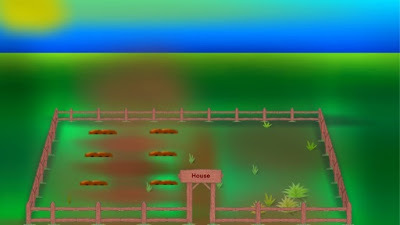 You see I put the hedges in the Farm scene to form a boundary around the area that you call the Level 1 farm. It was not a perfect solution to the problem, but I had no other graphics on hand to perform this task. Then today Leilani drew a fence for something (I am not sure what), and we both realized how good this would look for the farm, and also the new Field of Horses scene. I am very pleased the how the whole thing has turned out. What do you think, Improvement or what? I have been working on creating some new areas in the game. This will have a double (at least) benefit as I can make a nice Scene, and also place a special Character or two which will allow me to place more Quests. This will allow me to spread more quests around and make players explore and move more. This is the start of my new Scene. It is obvious why I called it what I have. I have placed a number of Horses, but I will place quite a lot more, and then I will have a special script to allow me to turn off or flip Horses to face left or right. I might seed this with the Time of day so the Horses move in a sort of predictable way.... Though I am uncertain how this will really look, it could be too haphazard to actually use this method. 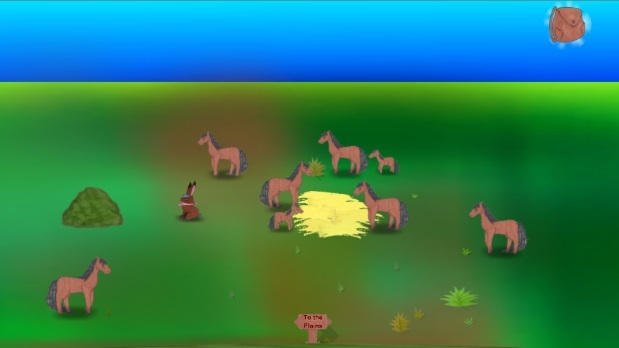 I also have to get some more backgrounds or something animating in this scene, but a lot of that will be taken care of once I get the Horses actually animating... oh yeah, they are all static at the moment. I still need to place the Special Characters and to choose which ones of the numerous ones that Leilani has drawn will go here. In fact it will be a discussion between me and Leilani. I am not certain what the best description is with what I want, but I quite liked this title. Use a Time based on real time (can be UTC or Local). Not based on time since the game started. Well I need to have my plants grow over hours, or possibly days. I also need quests to respawn daily, weekly, or perhaps even monthly. What happens is that when you have completed the Daily quest for the first time. I record the time and Date this was completed on. Then I can test this in the NPC's update function against the Real Time NOW. If the right number of hours has passed, then I can once again respawn the Quest on this NPC. The same goes for objects collected in the game respawning. I had no real idea quite how to do this at first, but research was easy to come by, even if my search terms were not great... apparently. As you can see from the answer, it is Actual C# code that I used in Unity within my Very Bunny Haha game. I am very pleased to announce that this code is working fine. I made it into a function and I record the seconds in my Arrays for respawning stuff. I hope you also get to write something like this in your game. I bought the Incompetech music a few days ago. For a remarkable 48 dollars I could get everything on the site. Which is ace, even if I only need a few of the pieces of music at this time. I did not get one of the newest pieces that I desire, but I shall go buy that one individually soon. Now I have the tough job of trawling through something like 1136 pieces of music and flares etc. Yikes! I estimate that would be more than a week of full time listening. Luckily most do not really apply to this sweet and charming bunny game, however ya have to keep ya ears open and your mind as well. At time pieces of music will suddenly jump out at you and tell ya where they should be played. I also grabbed (not from Incompetech) a few SFX tonight for the 'Zoomy the Porcupine'' minigame. I grabbed the rings sounds from Sonic the Hedgehog, the one where he picks up a ring along with the one where he loses them all. The other SFX I grabbed was of Mario jumping from Mario Bros III. I have used them together in the minigame and now I wonder.... Have I crossed the streams? Personally I think they sound great together, and if I had a bit more time tonight I would some music to the game.. but that will have to wait. It has been a very long and hard working day for me, merging code and then debugging it. Ok, done, expect a new video of the Zoomy the Porcupine minigame soon. cos of course the little legs o the porcupines now animate (hard to see though). The above Video I created tonight shows off the Click 2 Move left mouse button control I have just added to the game. It doubles as movement control for Tablets as well, and that is the reason I even wrote it. I know I should code something else, but seeing the game on a tablet is simply so exciting to me. The first iteration of the Click 2 Move was a bit raw. It would move 100% of speed in the X or Y depending on where Jack was headed. So he tended to move diagonally and then in a cardinal direction to get to his destination. Only this did not feel good and Jack keep getting stuck all over the place. So changing this to variable X and Y speeds solved the issue and now Jack heads straight for the place you want him to go. So much smoother and more natural. I find I don't tend to click places he cannot reach like this too often. Well, as for the video. I tried hard to add titles and transitions and audio, but alas Pinnacle the editing software just kept breaking. So I got frustrated and just uploaded the raw footage. GRRRRrrr! So when I put the game onto my Kindle I found it as usual quite liberating and so incredibly exciting. Now I was not able to play the game like that, as I did not have touch screen kind of input for the game. Well although I have been busy doing several other things in the game, I couldn't help but knock out a simple mouse click move (took me about 8 lines of extra code). This took me about 20 minutes to get working, and tonight I followed it up with about 15 minutes more to do a modification to allow the point click move to go in a straight line to the destination, as the first implementation moved the joystick as far as the game was concerned. This new implementation is nice and caused me to once again put the game onto my kindle. The game is so cool on there, all vibrant and filling my mind with possibilities. Still I also realized when looking at it with my daughter that I do not have a 'Use' method... and in the 2D scenes I need a jump, I wonder what I shall do. With a two button mouse it is easy enough, but for the tablet I will have to come up with something. I may have to look at some other games, not that I know of anything exactly like this... hmmm. Any suggestions hehe? I thought I would start writing Blog posts with a picture at the start instead of writing some stuff and then inserting a picture or two. Of course if I have more than 1 picture to post I will still start with a picture and then work my way down. I think will improve the Blog posts a bit. I am sure readers have noticed how I tend to post more pictures now to go with each post as well as I think pictures can say so much. 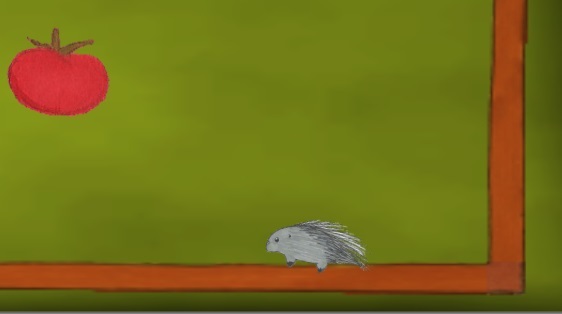 In the above image you can see that Leilani drew a Porcupine for the minigame, though I am still in need of swapping the Tomato out with something more reasonable. We did discuss what and Leilani wants to go with an egg. As this game has a cross connection to Sonic and Egg could be the best way to go.... Though I am still not sure, perhaps a ring would be better ? Along with this I bought a Save and Load asset from the Unity store (more on that when I get to work with it soon). I also tidied up several issues within the game, like the end of Zoomy the Porcupine, which ended as soon as you were hit, no final particle effect etc, but now it ends much more nicely. It has been a busy weekend off camping with the Boy Scouts, and so it is time for bed. I titled this blog post because it is one of the things that has been wrong and bugging me for several weeks now, probably more like 2 months. Yes, you guessed it, I have solved the issue and as I expected it is something simply, something obvious really, and I missed it several times trying to solve this bug. I was using a Sprite renderer in the Canvas, Instead of using a UI->Image. See, told ya it was simple. Changing the images that are not showing up to this kind of renderer has completely fixed the issue, though I have a few more buttons to fix. Now I have been busy thinking about and occasionally spending a few minutes writing code to bring in the Main Menu of the game. This also doubles as the Main Menu inside the game when you press escape. It contains the ability to load and save a game, along with several other features, namely Quitting the game. I have about finished this now and this means that very soon now I will move onto the Saving and Loading code... a very exciting development for a Quest and growing based game. All right, I need to sleep now, been a rough few days health wise. Here is a picture of my good old Amazon Kindle, with Very Bunny Haha on it. 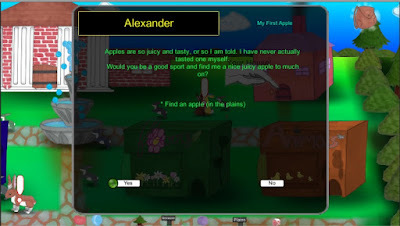 Today in Unity Club our task was to create the simplest of projects and get it to download to an Android device. For this we had my Laptop and Khalins phone. With some fumbling and bumbling we managed to get the Phone set up to allow the ADB bridge to connect to it. Meanwhile I was working with a few of the guys creating the simple App and then trying to get it to create an apk file. It went quite smoothly and within 30 minutes we were trying to upload the App to the phone. We all cheered when the simple check mark of the App showed up on his phone. I am sure we are all thinking of the power this gives us to write stuff, any kind of stuff for our phones. This of course is not my first time running my games or code on devices such as phones and tablets. 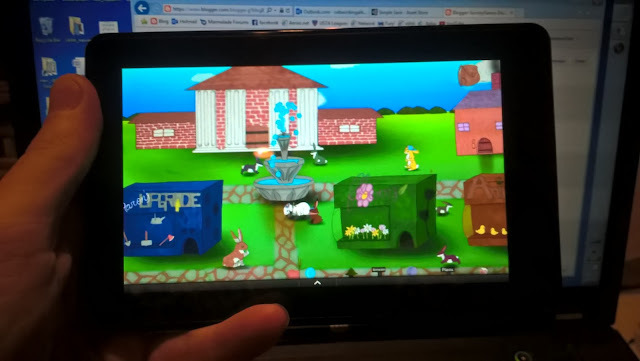 But I have to say I am extremely excited to see my first Unity project on there... and it made me Need to try and upload the same App to my good old Kindle Fire (1st Gen). Ok, so it took me a bit of time to get it all correct tonight, uninstalling the original driver I had and installing the new one. Eventually just as I thought all hope was lost and was pondering the expense of buying a newer Android device.. it goes and freaking works! Woohoo! The picture up top of this post though is what I did immediately After the check mark App installed. I tried Very Bunny Haha, and it worked first time (Thanks Unity). And I have to say that the game looks simply stunning... Really impressed at how good it can look. Now of course I am thinking I need to get that point and click interface done sooner rather than later.. haha.. always more to do. I wrote a fair while ago about buying a very useful bit of code from the Unity store. Here it is in operation once more, but not for the Generic rabbits like the first time. This time it is for Rocky. One of the Mysterious creatures you will meet in Very bunny Haha. This video also meets much more of my expectations for videos and I will continue to improve as I do more. This is a very exciting turn of events, and next time when I use a microphone set up, it should make me a lot happier. I have been rather frustrated with the videos I have been trying to make. I cannot seem to get them quite right even though I have been able to improve what I was making. There were several issues... for example. 1. The video is none standard rez and aspect ratios. This is because some videos I want to create from the Unity3D editor itself. The other videos I created that were better required me to take extra steps of making an actual build to record. 2. I record the videos without sounds in them, I really want and need to make an audio overlay (commentary) for the videos to make them not just more interesting, but also more personal (something I wholeheartedly believe in). 3. When I re-process the videos, even without my audio they become all blurry and indistinct. 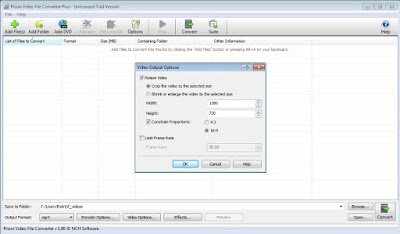 I really need a way to take whatever I record and crop the video to allow me to make it letterbox and conform to normal resolutions, such as 720p. Yes it is true. I can take whatever odd sized and aspect ratio videos I record and can process them in a way that crops them (no stretching or shrinking is very important). To do this I needed to resurrect an App that I have not used since I worked on the Shaq game 20 months ago. With this newly processed video the video software I use will not rescale it and so it looks great, and though I have yet to do it, the audio should be easy to add (wish me luck). In that previous image you can see that I used Prism and set the video reprocessing to Crop. I also set it to create 720p video, which it did very nicely. Well back to work on the audio commentary now for my latest video.